You can categorize time entries even further by using tasks (in addition to using tags, clients, and projects). Tasks provide you with an extra level of hierarchy and can function as sub-projects. Tasks are mostly used for type of activity (eg. design, coding) while description field for the actual thing you’ve worked on (eg. “Working on bug #213”). For more advanced task management, it’s best to use a dedicated project management tool like Trello, JIRA, etc. For example, you can name tasks by type of work (“Front-end programming”, “Writing”, “Designing”) and later sub-group time entries by task in the Summary report to see how much time each activity took. Click Add and people will then be able to choose it when tracking time. To delete a task, click on the three dots next to it and select Delete. To change task name, simply click on its name and type what you want. Only Admins and project managers can manage tasks on projects. Marking tasks as done is really useful if you have a lot of tasks on projects, and you organize projects as to-dos (the other workflow is to put types of activities as tasks, like coding or design, in which case there’s no need to close tasks). Once you have tasks, you can assign users to them or leave the assignee as Anyone. When a task has Anyone as the assignee, everyone who has access to that project can select it in the time tracker. If a task has a particular user as the assignee, only that person can select that task in the time tracker. If it’s a private project, you’ll have to add the person to that project first. If you often create projects with the same task structure, you can set up a template so you don’t have to add these tasks one by one every time you create a new project. 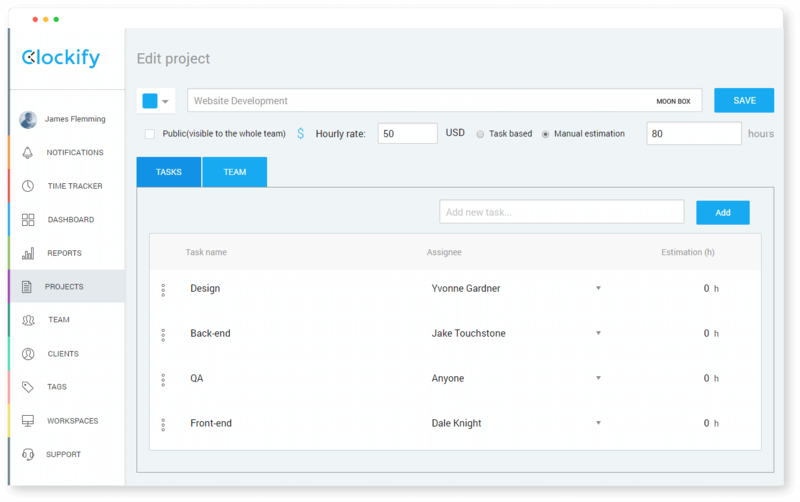 Projects you create with an existing template will have settings such as Tasks, Billable Rates, Estimates, and Team already applied.